It’s been a few months since we moved house, and as much as I had dreamed of my life and probably as a result the blog being awash with interiors inspo and plans and new projects… turns out this whole ‘moving house’ thing is pretty expensive and doesn’t quite leave as much free flowing cash for statement rugs and new wooden floors as I would have liked. So a lot of the plans and projects are going to have to be done bit by bit or just over time. 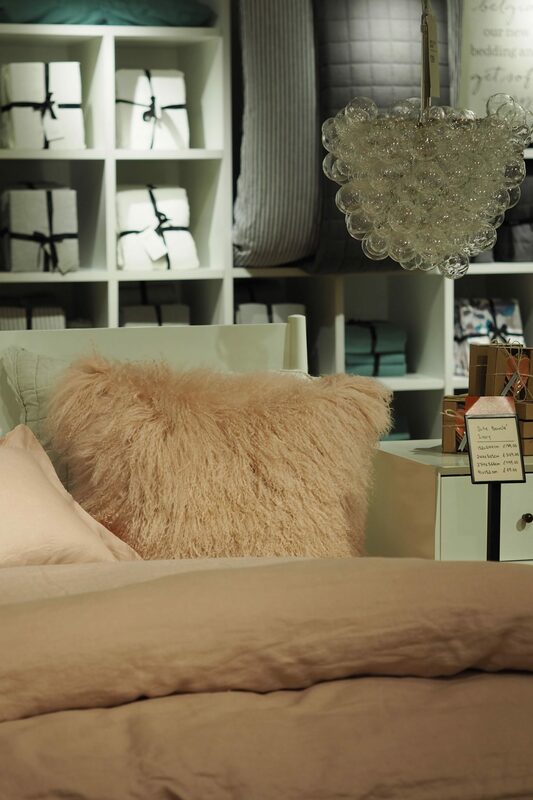 But whilst I’m saving up for some fun stuff behind the scenes I thought it’s a good time to show a few little interiors inspiration bits I have some pretty snaps of from two of my favourite home shopping places – West Elm and Loaf. Starting with my Spring Home Wish List from West Elm this week and keep your eyes peeled for a post on some pretty things from Loaf that I’m lusting after coming soon. 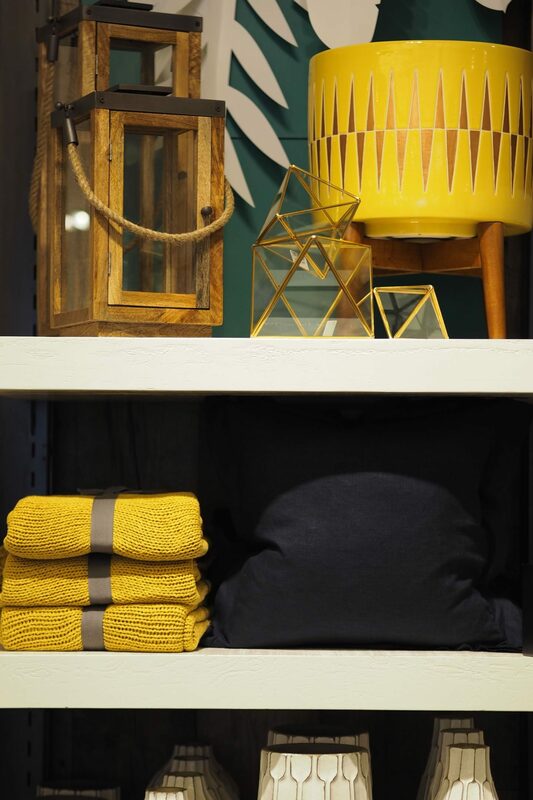 Both West Elm is filled to the rafters with pieces that manage to be unique, interesting and totally Pinterest worthy. Every time I visit the store my wish list just expands to a whole new level. This is the place I wish I could have a supermarket sweep style raid of. Although that’s probably a bad idea as I’d most likely break something careering around there with a trolly. A little while back I popped in to check out what was new in store and hear about what they have coming for Spring. So I wanted to share a few pics of the key bits that caught my eye. 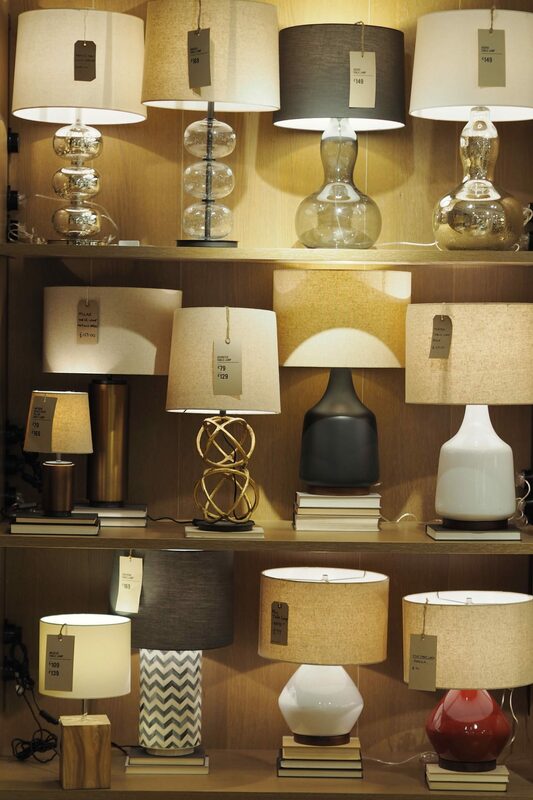 Now one thing about West Elm I should mention – and this is very much just my personal taste – is as much as the mid century vibe that they’re experts at, it isn’t ALL about that store. Which suits me down to the ground as whilst I love the trend it’s not one I’ve jumped on at home all that much. What I’m trying to say is, that even if you’re not a die-hard mid century style lover, then West Elm is very much still a treasure trove of other interiors goodies to suit everyone from the super classic to the more quirky and modern. 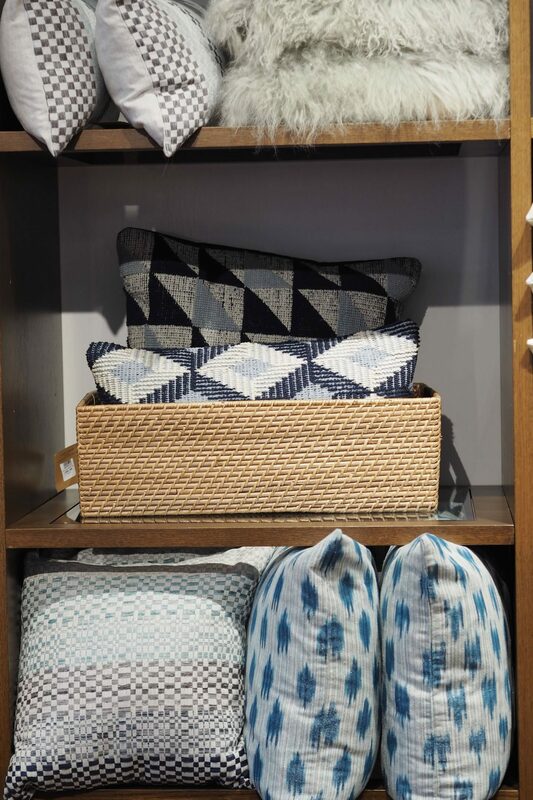 One trend/style I always find myself drawn to in West Elm, and interiors shopping in general is the graphic/ikat style prints. SO the frames above with the triangle prints and the Ikat style print pillows above all call my name. The wooden and marble book ends on the shelf in the snap above were on my Christmas list and still firmly on the wish list. These would look fab in our living room as the wood/white marble combo would be perfect. 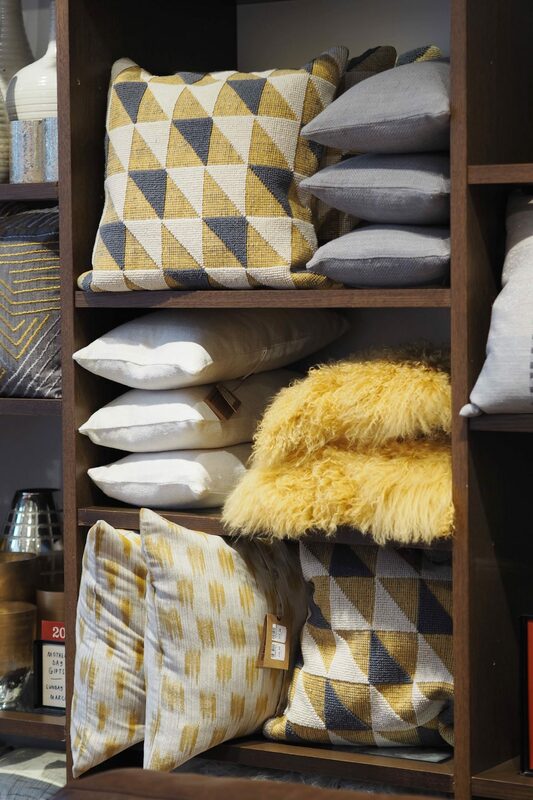 One of the things that really makes West Elm unique is how they work with independent artists and local creators to bring unique designs to store. Below are a couple of animal print table ware pieces that I love (am a sucker for a rabbit print). 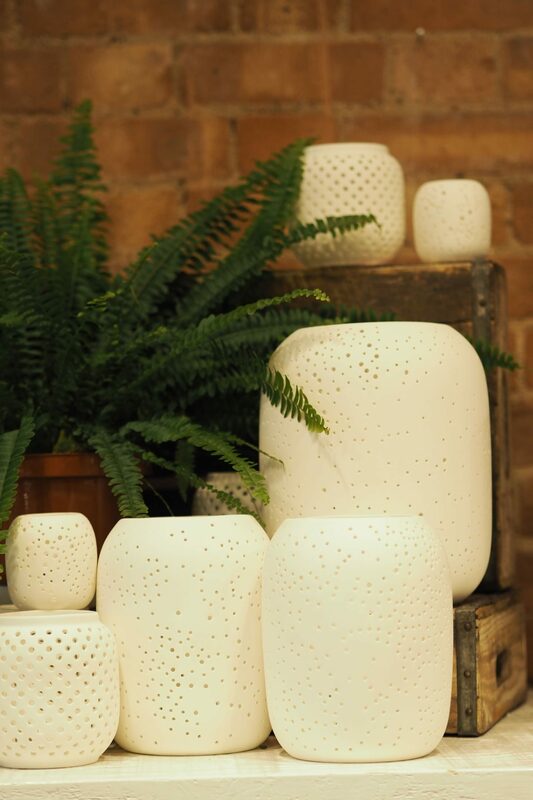 With the second being by Rachel Kozlowski – an independent artist and just an example of one of the ways they’re bringing unique designs to store. Rather than just relying on a conveyer belt of generic design as some stores can tend to. 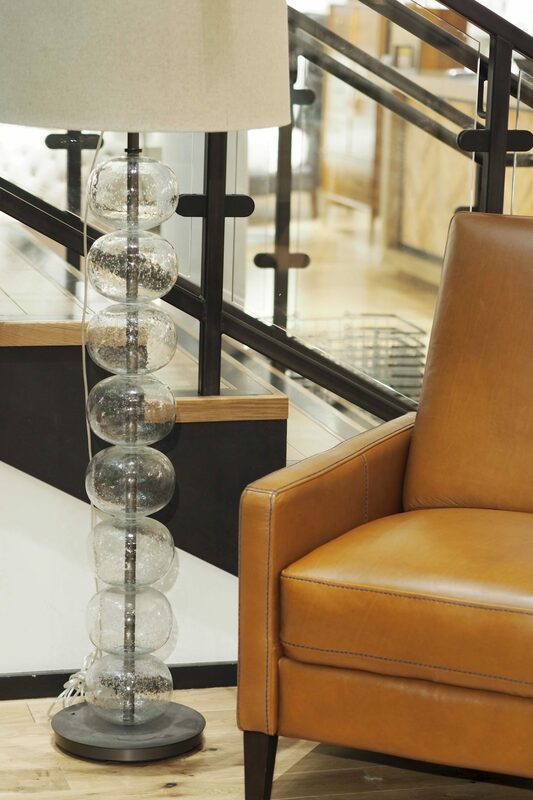 It means whilst it’s a store that’s accessible and affordable but still has unique finds that can give your space a more personalised touch. One of my absolute favourite items that you can get from West Elm are these really unique glas planters. Each one different as the glass is shaped to a piece of drift wood as the base. Available in a range of sizes, the shape and style of each one differs so you really do need to see them in store to pick the one you want. We have a little conservatory in our new home which I’m turning into a jungle with as many house plants as I can manage to keep alive and think one of these would be a great fit in there so these are very much on the list! A couple of other ideas-sparkers from my West Elm Spring browse. Adding new splashes of colour. One thing I’ve always found a tad tricky is getting colour schemes right and looking coordinated without looking matchy or like they’re out of a catalogue. Case in point our living room is all white/grey/blue. Which was starting to look a little catalogue. So I’ve started to add some mustard yellow in there too now to break it up a bit and just brighten for Spring. I decided to do this after seeing the display below in West Elm as reminded me how much mustard yellow works with the colours we already had. I just need to add a few more little details and will do an update post. 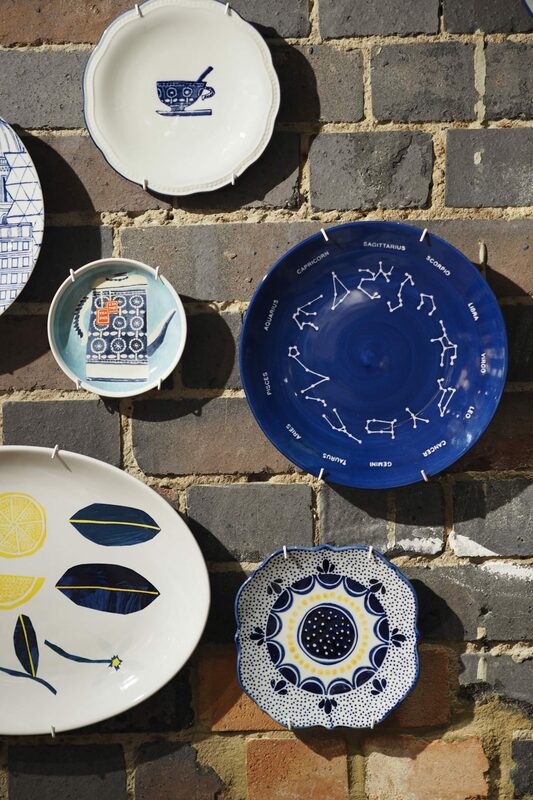 Another idea I liked from West Elm was using plates as wall art. Ok, so it’s something my Aunt used to have on the walls at home, so not a brand new idea/trend by any means but maybe a nice way to add a little something different to a gallery wall. I really like the star sign plate in the snap below in the deep blue shade. The wooden coffee table above is an absolute beauty and would look fab in the conservatory. It just might be a smidge too big but I spotted they have a smaller size in a similar style so it will 100% be mine. I also love all the sand blasted glass ornaments and decorative things they have – the shades of blue and turquoise are perfect and I love how they don’t look shiny and new. The displays at West Elm also remind me I need to get a fern in my life. And maybe a bronze armadillo. You can see all the West Elm items mentioned in this wishlist over on my Home Wishlist Pinterest Board (and more). In case you’re wondering the West Elm store in London is on Tottenham Court Road with the nearest tube being Goodge Street (it’s right across the road from the tube). Happy shopping!